How do I adjust for GPS inaccuracies? Due to the limitations of current GPS technology, a degree of "drift" may mean that different runs on the same track may not correspond exactly. 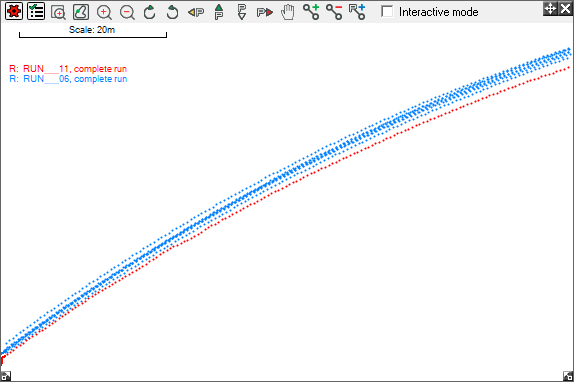 As you can see in the illustration given below, the two runs that have been loaded into the analysis software do not sit perfectly on top of one another. This disparity can be manually adjusted using the Race Technology v10 "Run Manager". 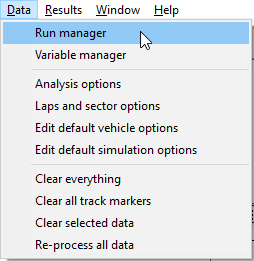 Open up the "Data" menu at the top of the screen and select the "Run Manager" option. This will open up a window. In amongst the other tools shown in this window, you will find the "Manual Map Offset" section. In the top, right hand corner of this section, you will find a box marked "Step". 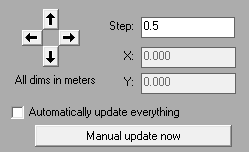 Use this box to adjust the increments by which you wish to adjust the track map. A small number in this box will allow you to adjust the track map by very small and precise increments. A higher number will allow you to adjust the map using bigger steps.